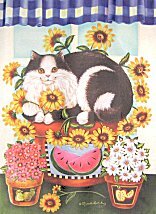 Here is a tuxedo cat sitting on a pot of sunflowers. This large polyeter flag is 39" high x 27" wide. This was a vendor's sample so it is unused. New. 1 only.